/ Modified aug 2, 2016 3:49 p.m.
A Tucson police officer stops motorists from crossing a flooded wash on the east side. 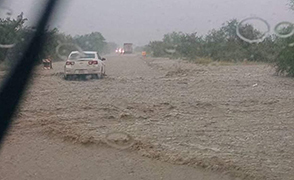 Tucson's wet week was punctuated Tuesday with heavy rainfall as early as 6 a.m., the National Weather Service reported. Up to 20 roads were closed, with washes barricaded because of flooding, throughout the metro area. Public safety officers reporting making six rescues of people from floodwaters and two schools in the Vail Unified School District were evacuated because of flooding. 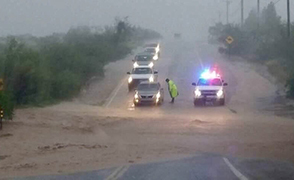 The Tucson Police Department stationed officers at some roads to remind drivers not to enter flooded areas. The storms were expected to continue through Wednesday, said Dan Leins, a meteorologist at the National Weather Service Tucson office. The ground is saturated from the rainy week, he said. A driver tries to ford a flooded road. The ground cannot absorb more water after more than two inches fell in some parts of town, Leins said. Those who prefer the hotter, drier part of monsoons will have to be patient. Beyond that, it’s hard to predict what the rest of the monsoon will bring, he said.